Summary : The RoguePak is an affordable, eco-friendly solution to the problem of replacing hydration packs. What’s not awesome is coming home tired from a hike and forgetting to empty them for a week. Sometimes you open them up and it smells like Grandma’s basement. You know the smell I’m talking about. Or how about that concert you went to last weekend? You know, the one where you thought it was a good idea to fill it with gin and tonic (good idea) and fresh squeezed lime juice (bad idea) and it sat for a week? RoguePak has a great solution to these problems: cheap, easy-to-fill, recyclable cartridges. When trying to make a disposable hydration pack affordable, one problem you run into, is the way you fill it. A screw-on cap means more plastic to produce it, more energy to recycle it and a higher cost. RoguePak gets around this problem with their Secure-Seal Clip. Honestly, it looks like it wouldn’t work very well. My thought was “really? A plastic tube?” Guess what – it works great. The RoguePak comes in 50 and 70oz sizes. Another thought I had when I opened it, was that the cartridge (as they like to call it) seemed thin, and not very durable. I didn’t have any problems myself, but I wondered about long term use? What if I didn’t want to throw it away? Then I ran into this video of a meteorologist (interesting choice) watching one pop on Youtube video. It’s pretty crazy how long it held up. 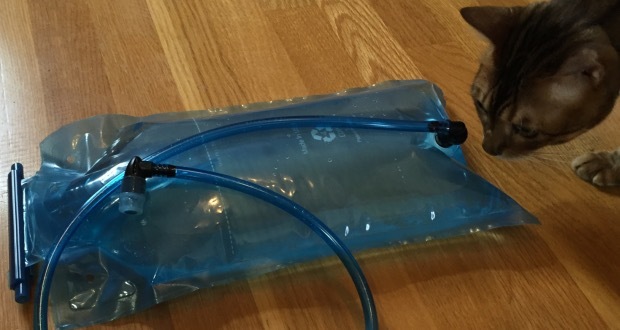 The Vendflow plastic tubing that comes with attaches easily to the bottom of the cartridge, and has a well made bite valve. I really like the RoguePak. The only complaint I have is that it is a little more difficult to fill compared to a bag with a screw-on cap. There is no structure whatsoever, so it’s a bit finicky. Dealbreaker? No way. Not when you can get them for about $6 each on Amazon. If you use your hydration pack on the regular I guarantee these will come in handy. Save the screw-cap one for water and put Wassail in the RoguePak for you midnight snowshoe.